Today's post, as well as tomorrow's, is a bit different than what you'll normally see around here. Basically I'm sharing the notes I made while listening to Wilson's lectures and you can tell. The format is different but I still find the notes worth posting. Glean what you will. It should be noted that these are topical talks, so there is no specific order in which you would need to read the Narnia books in order to follow along. 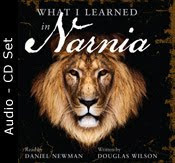 Wilson suggests reading the books in chronological order to help you understand the history and progression of Narnia as he says it will help you put a lot of things together. Wilson is very clear to point out that Lewis was adamant that these books were not an allegory. Rather, they were "a great supposal." “Suppose that….” Aslan occupies the Christ position in these books and it is important for us to see the heart of true authority in these books. In his first lecture on the topic of authority Wilson talks about using authority the wrong way, using it the right way and submitting to authority in the right way. He starts by talking about using authority the wrong way, giving examples of characters and situations in the book to illustrate his points. The Scrubbs also present a picture of denial of true authority. (Voyage of the Dawn Treader) Eustace calls his father and mother by their first names, refusing to acknowledge parental authority. This is a picture of egalitarianism, saying that everyone should be the same. It is a rejection of authority. The false of authority of the magician (Jadis & Uncle Andrew in The Magician's Nephew) They both believe that they are “above the rules.” Rules are for commoners and they feel as if they are more important than others and they do not want anyone telling them what to do. Ahoshta Tarkaan (The Horse and His Boy) - wields authority from groveling and manipulating – playing the system. His is authority gained though flattery which is a false authority. The Dwarfs (The Last Battle) – “The dwarfs are for the dwarfs!” What they are saying is that they do not acknowledge any authority over themselves at all. All of the characters listed above are about grabbing, getting and taking. No one has to teach these behaviors to us. Sinful humanity latches on to these attitudes. They are part of the sin nature which we are born with. (Ps. 51:5) Jesus came to deal with these things. Of course, Aslan sets the example or pattern for true authority in these stories. The heart of all true authority is through sacrificing and giving. The Bible teaches that if you grab for authority, you lose. If you give yourself, you gain authority. The person who sacrifices gains respect and admiration and positions of authority. When people demand authority, it will run away from them. Miraz? He grabs, he loses. Jadis? Finally defeated. An example that Wilson gives from scripture is of Abraham and Lot. (Genesis Chapters 13 & 14) Abraham gives Lot a choice in the land. Lot chooses greedily and it turns out that his choice is eventually destroyed because of the sin of the people. Lot got his choice in the short term but it was not a wise choice and his family was eventually destroyed. Is Aslan, the true and right authority a safe character? No. As Mr. Beaver says, “Of course he isn’t safe! But he is good.” He loves. He sacrifices. Aslan’s goodness is unsettling and scary which cause people to react negatively to his authority. They do not understand his ways. His servants, however, following in his footsteps, are humble. When Aslan asks Caspian if he is ready to rule, Caspian says he is not. Which is exactly how Caspian should feel. "When you know you are not ready, you are ready." Frank the Cabbie (The Magician’s Nephew) is also asked if he is willing to serve in Narnia. Frank doesn’t feel confident. Aslan breathes the confidence and assurance in him, building humility. When you are in authority – you are the first in every attack and the last in every retreat. A king puts himself out front to “take the fall” or lead the army in battle. This is what it means to be a pastor, a father, an elder, a husband. It means stepping up to the plate and taking responsibility and overseeing the people and situations that God has given to you to govern. It is a great responsibility and requires sacrifice and humility. Wilson concludes his lecture by talking about how we are to rightly submit to authority. For the sake of length I'll only discuss his discussion of Trumpkin the Dwarf (in Prince Caspian). Wilson points out that Trumpkin doesn’t believe in Aslan but he believes in and will fight for the Narnia. Dr. Cornelius brings the Narnians Susan’s old horn to summon help. Trumpkin doesn’t believe the horn is of any value or will bring the Narnian army any help. He gives his input and then submits to the authority of Caspian. Definitely a thought-provoking lecture and an eye-opening one as well. I love that last line yo quoted from Trumpkin. I remember that really striking me as I read the book. Lots to ponder there! Sounds like Wilson really has a lot of insight on this! !